A school shooting was narrowly averted last week in Georgia. A group of teens are on trial in Oklahoma for killing a college student because they were bored. Fraud and child abuse. The list goes on and on. Add to these the personal tragedies that so many people are dealing with. In one week alone, I’ve read messages from people who are going through separation, miscarriage and serious car accidents. Between the national and personal tragedies, it’s hard not to feel isolated and alone. Fortunately, Christ knew all about that feeling. He knew what difficult tasks and overwhelming odds would do to our moral. I think that’s why he gave us the Lord’s Prayer. Take a look at it. 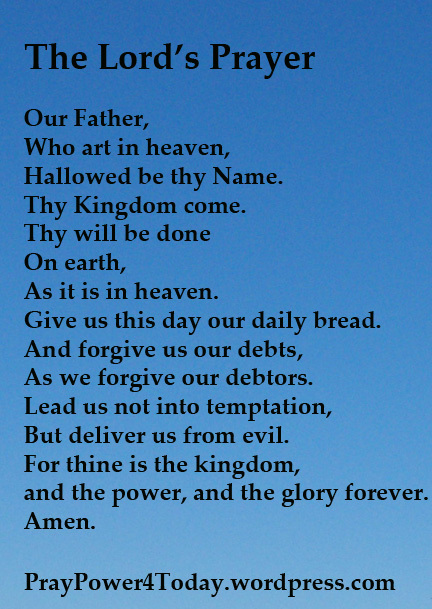 No one who says this prayer is saying “my father.” This is a prayer to Our Father. It isn’t a prayer asking that one person’s needs be met or that this single sinner be forgiven. This is a prayer for us all. It covers all of our needs and all of our sins as a group. When we say it, we are part of something bigger than ourselves. We are part of the community of believers – across the country, all over the world and throughout time. And that pesky little discrepancy, debts and debtors vs. trespasses and trespassers? To me, it works as a reminder. We may not be alike in every way. We don’t even pray in exactly the same way. But we are His and He is ours and we are part of one vast community. We may feel down and out of touch with society, but we are not alone. It was a day like any other for the no-nonsense school bookkeeper. Up early. Taking care of her special needs son. Getting dressed. Hitting the road to get to work. When she arrived it seemed like business as usual… until the man in black barged in. He’d just been outside, shooting rounds of ammunition at police, and now here he was. Right in front of her. And she was his hostage. But as the day wore on, it became clear that Antoinette Tuff was a force to be reckoned with. At one point, the gunman mentioned suicide and she deterred him with her own story. She talked the armed gunman out of hurting himself or anyone else and made headlines around the world. After it was over, she said it was her faith that had sustained her. “I give it all to God. I’m not the hero. I was terrified,” she told the media. The principal said that Tuff was one of three school employees who had been specifically trained for hostile situations. That surely must have helped, but it was Tuff’s own personal traumas that gave her the heart of compassion and the words of healing she needed on that fateful day. This event reminds us that faith is a forcefield in a world filled with turmoil and that troubles are really training. What you’ve been through makes your faith deeper, your compassion more concrete. You can honestly say, “I know how it feels,” because you’ve been there too. After the police took away the gunman, Ms. Tuff spoke to the 911 operator she’d spoken with throughout the ordeal. Now that’s what I call grace in action. On my radio show this week (www.blogtalkradio.com/openbook), my friend Alice and I talked about monsters. Not the childhood kind that hide under beds and in closets, but the real-life kind…the ones you don’t see until it’s too late. The ones who walk among us, hiding behind human faces. During the L.A. riots, I lived in Long Beach, just south of L.A. What I saw during those days can only be described as monstrous. Please understand: I am not singling out a particular group of people. It seemed to be everyone. The whole world had suddenly taken off their masks, and I saw what I hadn’t seen before: I had been walking among monsters. Certain images stick with me still: A businessman in a BMW driving up to an electronics store and gingerly walking through broken glass to steal a TV. The angry face of a man, on the roof of his business with an assault rife, shooting to defend his property. The laughter of a girl bragging about how many outfits she’d just stolen for her baby. A tank rolling down the street where I grocery shopped every week. And I remember this: standing in my bedroom and thinking, “How can I go on living in this world, knowing what I know?” I’d seen the monsters, and they were us. How was I supposed to forget that? In an early episode of “Buffy, the Vampire Slayer,” Giles the librarian explains that people forget what they cannot face to be true (in this case, a vampire attack). This is true of most run-ins with monsters. I thought I’d never forget what I’d seen, what I’d learned, and in some ways I haven’t. But I learned to cope with it and let it fade to a less frightening, less vivid picture. A little active denial didn’t hurt, either. What I know to be true is that God does not make monsters. We do. We take the gift of free will and use it as a club to beat someone else, as a rock to throw at a kind helper, as a weapon of mass destruction. Why? Because we can. The hideous reality is that we abuse the unique quality that makes us like our Creator. I’m willing to bet God really dislikes that. So what can we do about the problem of monsters? We can keep ourselves from becoming one by practicing empathy, by promoting gentility, by promulgating kindness. We can turn the other cheek, giving potential monsters a chance at regaining their humanity. We can forgive. There will always be monsters among us. The trick is to love them, love them fiercely. No matter how scary it gets. 5 This proposal pleased the whole group. They chose Stephen, a man full of faith and of the Holy Spirit; also Philip,Procorus, Nicanor, Timon, Parmenas, and Nicolas from Antioch, a convert to Judaism. 6 They presented these men to the apostles, who prayed and laid their hands on them. Lately I’ve been reading about spiritual discernment, the act of prayerfully discovering the path God would have us walk. Because I often pray alone, I am fascinated by how discernment as a church calls for a group effort. The reason is simple. None of us has a complete understanding of God’s will. I see what I am capable of seeing. You hear what you can hear. There is much that we both miss. As a group, we will hear and see more completely. 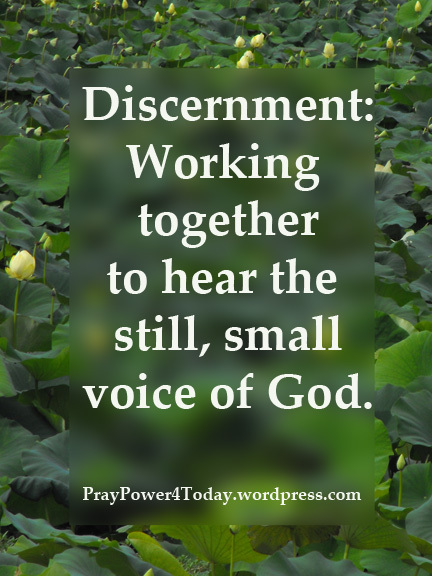 For discernment to work, it must be inclusive. Next comes prayer. What is it that God would have us do in this situation? Whether it is a question of who should serve or how we should act we have to pray. Of course, this also means that we have to wait for an answer. Waiting is so often where we fall short. For discernment to work, we must wait for an answer and not outrun the Holy Spirit. Scripture is also a part of discernment. This is a time for asking “what would Jesus have us do?” It isn’t enough to have memorized verse after verse. We have to hear, as St. Benedict put it, with the ear of our heart. Argument and law aren’t the rules here. For discernment to work, we have to listen and feel the Holy Spirit at work through, specifically the words of Christ. In discernment, there isn’t a right answer and a wrong answer. There is a Faithful answer and that is a both/and answer – both my concerns and your concerns must be addressed. This is very different from “the majority rules” or “you can’t please everybody.” We can read one example of this is in Acts 6:1-7. When Greek Jews complained that Greek widows aren’t being given aid comparable to that of Hebraic widows, the Hebraic Jews didn’t vote them down although as the majority they could have done so. Instead they listened with their hearts and put a panel of Greeks over the alms distributions. Everyone was happy. For discernment to work, we must hear what everyone has to say and we act accordingly. Just how different would our churches be if this is how they we made decisions? To prayerfully applying the word of Christ even to our disagreements with each other. It could solve a lot of problems. Here’s the thing about blogging: There’s no guarantee that anyone will ever read what you write. To put words out there, into the ether, and hope they land in the eyes and ears of the right folks (or any folks at all) necessitates a profound act of faith. I don’t care whether you blog about spirituality or soba noodles, God or government — you might as well shout your opinions into the mouth of a cave. Perhaps a daring spelunker will catch your cries. Or maybe a hibernating bear will swivel a deaf ear in your direction, heave a sigh, and go back to sleep. You never know. I’ve been writing this blog (with my two dear friends) for two years now. That’s two years of intense belief that what I have to say is worth saying. But to whom? If I’m doing this for other people, then I’m doing it wrong. Every week, I release a little amoeba of thought into the vast ocean of the Internet. The odds of it wending its way to those who really need it are about a billion to one. It’s like finding a needle, not in a haystack, but in a field of hay the size of the Mall of America. No. I must be doing this for myself. It is the only thing that makes any sense. With this realization comes a follow-up question: Why? Clearly, I’m passionate about the things I write about. Admittedly, I want to be heard. Which then leads to the big question: If a blog is posted, and nobody reads it, does it — like the proverbial tree in the forest — make a sound? But if I’m doing this for me, why should I care? Aye, there’s the rub! I do care. So, my spiritual battle comes down to this: A brawl between my soul and my ego. I need to not care whether anyone reads this. It needs to be something I do for me, just like the hobbies SueBE wrote about in her post this week — something that sustains me for the journey, not something that saps me of my will to keep marching on. So yeah, I want to keep doing this. And I will. And if a nugget of wisdom lands in your lap, good for you. But good for me for keeping up the conversation…even if nobody is on the other end. After all, God is always listening. 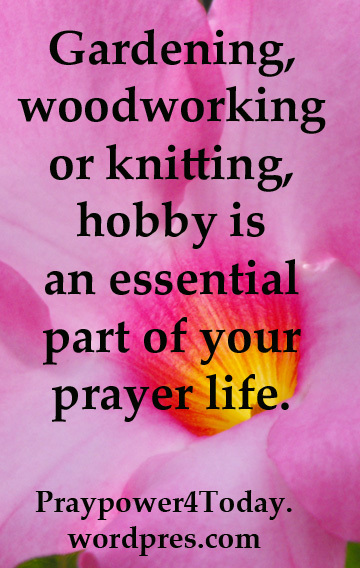 Do you consider your hobbies part of your prayer life? Do you knit one, purl two prayerfully? Or maybe you weed and mulch in a meditative way. If you don’t think of your hobbies as part of your prayer life, perhaps you should. You may think that I’m going to talk to you about living mindfully, considering God in your daily tasks. That is a good thing to do, but that isn’t what I meant. Prayer is how we communicate with God. That means that we talk to Him as well as listen. Through listening, we discern what God wants us to do. In my own experience, these tasks, even the wee small ones, take a certain amount of energy. What happens when you take energy out, doing God’s work, but never recharge? Eventually you burn out. Soon you are, as Lori wrote, Hanging In, Hanging On. To restore balance, you have to recharge even if you feel like you don’t have time. In fact, this is often when you need most to reenergize. Sometimes this means getting enough sleep or taking the time to fix yourself a good meal. Those things recharge our bodies. But we also need to recharge our spirits and that’s where our hobbies come in. Our last pastor did wood working. I know church ladies who sew, garden and knit as well as do puzzles, go to the theater and watch baseball. One of the church men cooks. Another restores cars. We all have things like this that make us happy and when we do them we recharge our batteries. It may seem a bit decadent but it is 100% essential. If you don’t take some time for yourself, you will eventually be an empty shell with nothing left to offer. Avoid this by doing something that makes you happy. Scrapbook. Pick up a new cross stitch project. Write a poem. When you are done and you once again have a smile on your face and spring in your step, God will still have something for you to do. The difference is that now you’ll be more able to handle it. A musician I admire once wrote these words: “Everyone gets tired of being out of reach.” The words are evocative, I suppose, of his life: He died this past April; Internet speculation pegs it as a suicide. We all get tired of being out of reach, of being misunderstood, unwanted, lonely. There may be millions of us crammed onto this planet, but that doesn’t stop us from feeling alone. Some days, job number one is simply to hang on. My friend SueBE has been criticized by people who ought to know better for allowing her son to hang out with kids that certain Good Christians find “unsuitable.” Reading about these kids, I find the G.C.’s pronouncements of unsuitability ludicrous. These are not boys who are breaking into houses, taking drugs, flouting their parents. They’re just boys. A little unruly, but good as gold deep down. SueBE is hanging in there by writing about her struggles. I bet she’s feeling tired, too. let our fingers not slip from the rock. with faith we are too tasked to ask for. is better than to drown. Last week, I wrote a post calling for an end to one kind of Religious Bullying. I challenged those mothers who, when they don’t approve of a specific child, encourage other mother’s to keep their children from playing with this “bad child.” I’m sorry, ladies and gentleman, but seeking to isolate a child you simply don’t like is wrong. This was one of the most difficult pieces that I’ve ever written because of my own experiences with this and other types of religious bullying. I expected a certain amount of backlash from religious conservatives, the people I most often see bullying people in the name of Christ. There was a bit, but not much. Not surprisingly, it consisted of people telling me either publicly or privately that they would continue to practice what the Bible tells them to do, especially in regard to certain Biblically banned sexual practices. Wow. Make assumptions much? That wasn’t even on the radar in this particular incident but I love the way some people bring it up to justify bad behavior on the part of other adults. It’s just like assuming that you’re in the clear as long as you don’t bully people in the name of God. But there’s a problem with that assumption. Whether we are talking about the bullying mother’s I encountered, gay bashing, cutting a woman down because of how she dresses, or badgering the school board into teaching your religious beliefs in the public schools, simply not participating is not enough. You need to speak up, even if you aren’t comfortable correcting your fellow Christians in a firm but loving manner. 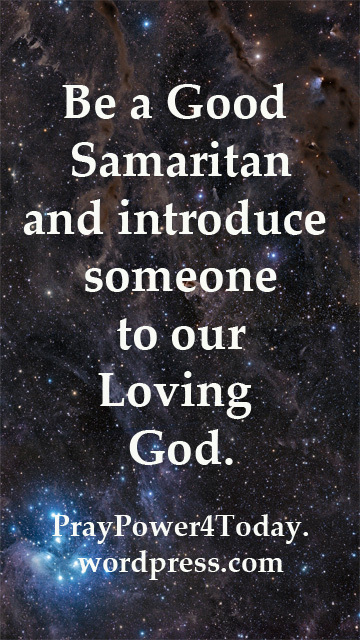 You do this by playing the part of the Good Samaritan. Reach out to those who have been robbed of their dignity. Far too many people I’ve talked to this week had a story to tell. I don’t know about you, but I want them to meet the God of love. He directed us to help people who don’t believe as we do and stood up for the woman who was about to be stoned. How can we do any different? He doesn’t judge gay people. In fact, he seems to be promoting a more conciliatory and open-minded stance toward gays in and out of the Church. He feels that women need to be given a more prevalent place in the Church. While the Pope does not (yet) promote the idea of women priests, he feels that women need a greater voice in the Church, and a more participatory role. 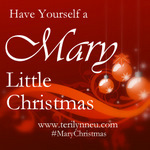 He went so far as to say that we need to recognize that Mary is more important than the apostles. He told the crowd in South America to “make noise” — that is, not to quietly accept complacency. He is thinking of ways to reach out to divorced Catholics, something that’s long been needed. To call these remarks “mind-blowing” is to limit their power. What Francis is discussing is revolutionary. Power for women in the Church? Acceptance of gays? No more telling kids to quietly accept what the Church says whole-hog and without question? Boom! That’s talking change on a cellular level. Many of us have longed for this kind of change for many years. To us, the words of our Pope are music, poetry, a dream come true. Of course, not everyone feels this way. Church conservatives are certainly cringing. And by conservatives, I mean the kind of Catholic who likes their Masses in Latin and their nuns docile. The kind of Catholic who liked Pope Benedict. The kind that wishes Vatican II hadn’t happened. To these people, I would like to say, “I understand.” It’s hard to watch the head of the Roman Catholic Church say things you don’t want to hear. I had to put up with it for most of my life, so I know how upsetting it can be. But please, try to be happy for those of us who are cheering, up here in the cheap seats. We’ve felt marginalized for so long. Words like Francis’ — hopefully backed up by actions — will bring disaffected Catholics home. It will keep our children in the faith. And we need that. So hip, hip, hooray for Pope Francis! He’s opening the doors and yanking up the windows. Soon a fresh, new breeze will be blowing through our beloved Church. I can’t wait.